Buddy up with a Bovine™ by adopting a calf. Your class will be able to participate in a year-long learning experience like no other. Forget bringing a rabbit, gold fish or pot-belly pig to school. How about adopting a 1,500-pound dairy cow as your classroom mascot? Don't worry about finding a pasture big enough to house her, we'll do that for you. Partner with our family to provide a year-long experience for your students. We'll help them discover where their food comes from and how important agriculture is to their daily life – even if their only experience with dairy comes from the milk they enjoy with their breakfast cereal and an ice cream treat now and again. Around the start of the school year, your students will have the chance to name a calf. They'll have the opportunity to watch the calf grow, learn about where she lives and see how our family takes care of her. 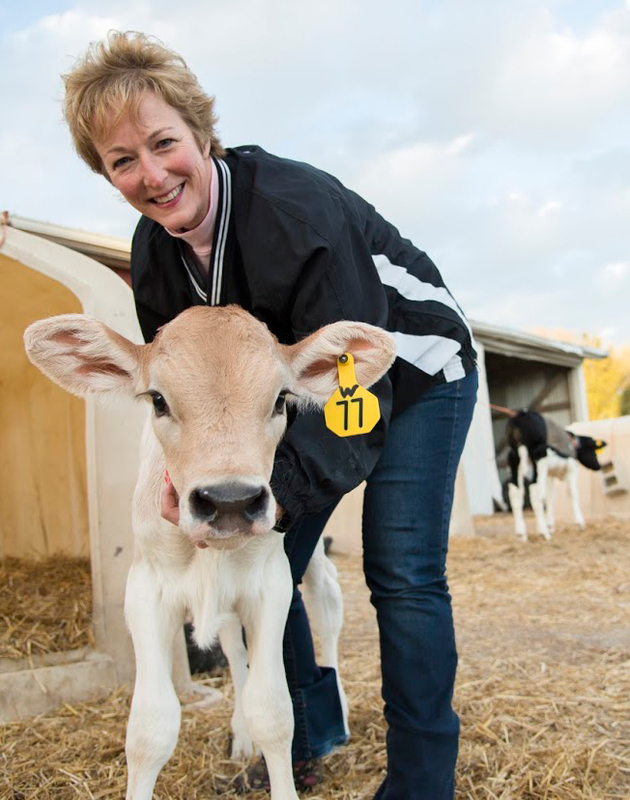 As their teacher, you'll have access to Wisconsin Dairy Council curriculum to incorporate into your lesson plans as you teach your students more about dairy. On a regular basis, we'll provide photos and stories about the calf – your Bovine Buddy. You'll hear from us about her growth, milestones and activities. After reading the updates, you and your students can e-mail questions and schedule a visit to the farm to see her 'in real life'. Upon contacting us and submitting the enrollment form below, your class will be eligible for enrollment in the Buddy up with a Bovine™ program. Registrations for each academic year are due by September 1 and you'll receive your introductory kit with details about your class calf in mid-September. Fewer and fewer students have direct access to a farm of any kind, and many curriculums don't include this style of learning opportunity. Buddy up with a Bovine™ is a fun way to incorporate science, biology, ecology, dairy and animal agriculture and even math into your classroom. *Special needs or considerations for your class? *How did you hear about Buddy up with a Bovine™?